Once upon a time, a young Kate McKinnon dressed up as Dana Scully. Now Scully herself, a.k.a. Gillian Anderson, has tweeted out a photo of the newly minted Ghostbuster in her X-Files costume, flashing her makeshift FBI badge. We can only imagine the range of emotions McKinnon must be going through. Emblazoned with the hashtage “#thefutureisfemale,” Anderson’s tweet is a tip of the hat to the past and present of awesome ladies investigating the paranormal and the kids they inspire. One day, McKinnon will be able to do the same for some girl who is currently perfecting her Jillian Holtzmann costume. It’s worth noting that Scully wasn’t just a role model for McKinnon. McKinnon actually credits Anderson’s performance with helping her discover her lesbian identity. “I figured it out by watching the X-Files and noticing my physiological reaction to it,” she once said in an interview via Queerty. 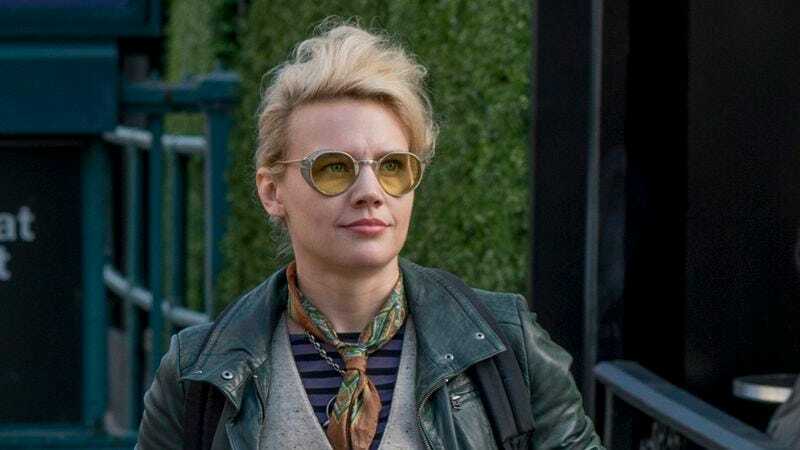 “I thought it was a product of David Duchovny’s face, but, no, it was Gillian Anderson who still is the queen of my heart.” To be honest, women are probably going to say the same thing about Holtzmann and McKinnon.